When the oil cooler seals go bad in the Porsche 944, normally you will see a "milkshake" mixture in the coolant tank. This is from the oil and water mixing together. 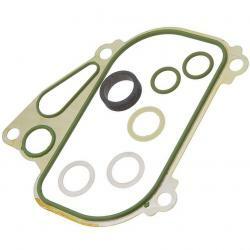 At the first sign of this the oil cooler seals must be replaced. While oil mixing in the coolant is not extremely harmful to the engine, eventually the coolant will find its way into the oil which will lead quickly to catastrophic failure. This seal kit has everything you need to replace the oil cooler seals on all Porsche 944 cars.